I’ve been here almost 2 weeks now, and I’ve been learning so much. 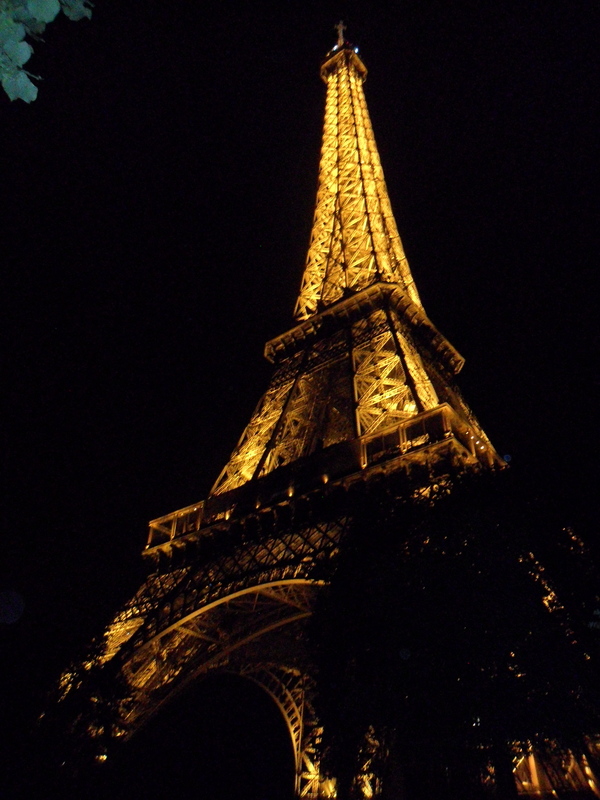 Mrs. Donnelly told me you might want to learn about Paris too, so I made this post for you! This is the Eiffel Tower, the most famous building in all of France! In French we say La Tour Eiffel, but some people call it “la dame de fer” which means The Iron Lady. This monument was built in 1889 for the World’s Fair in Paris. It’s named after Gustave Eiffel, the man whose company was in charge of building it (his company also made the frame of the Statue of Liberty in New York City!). The Eiffel Tower is about 180 stories tall! Can you imagine what it would be like to live on the 180th floor of an apartment building! You would have to climb 1,710 steps every day! In Europe, they use the metric system, so they say that the tower is 324 meters tall. When I changed that into the measurement system we use in the U.S. I found out that that’s 1,063 feet tall!!! Can you figure out how many yards that is? What about inches? If you’ve ever been to see the Washington Monument in Washington D.C., you know that’s the tallest building in Washington. It is 555ft tall. If the Washington Monument is 555ft tall and the Eiffel Tower is 1,063ft tall, which monument is taller? By how many feet? The light show starts every night at sunset. It sparkles for 5 minutes at the beginning of every hour until 2am. If the sun goes down at 10pm, how many times does the light show play? Can you figure out how many minutes the Tower sparkles each night? I hope you had fun reading this post and that you learned something new about the Eiffel Tower and Paris! Leave a comment if there’s anything else about Paris you want to learn about!! Anne, what a interesting post about the Eiffel Tower. You are a wonderful teacher! I was wondering if there way a way to go to the top of the Tower? The night view is spectacular. We liked watching the video. It looked like: cookie crumbs, fireflies, sprinkles, lightning bugs, raindrops, Christmas lights, lightning, popcorn popping, peanuts, pecans, snow, hail, flickering, and at the top it looked like a light bulb! We are wondering if they eat lots of spaghetti in Paris. Is there are elevator in the Eiffel Tower? Can you go to the top of the Eiffel Tower? How do you say the ABCs in French? When you go inside the Eiffel Tower do you have binoculars to see out? When you look down from the top of the tower, does it look like you are in outer space? How do the lights go on? What is your favorite shop? Thanks for blogging with us. We will post our math answers soon!! Ms. O’Connor’s 3rd graders and mom! -Spaghetti actually comes from Italy, so while they do eat it here, it’s not as common as bread and cheese, or other foods that come from France. -There is an elevator in the Eiffel Tower! There are three different levels you can climb to, the first platform, the second platform and the platform at the very very top! There are elevators to all three levels, though you can choose to take the stairs up to the first and second levels if you want (almost 600 stairs in total!). There are also two restaurants inside the tower, one on each of the first two levels! -I don’t have one particular favorite shop yet, but I think one of the best things about Paris is that every corner in every neighborhood has a local bakery! They open early in the morning and you can go in and buy freshly baked baguettes, croissants, sandwiches, and the most delicious pastries all baked that day in the store! I wish we had more of these in the United States! We all thought the math problems were easy. You can post harder ones next time! Thanks for teaching us about Paris and the Eiffel Tower. We did not know it was that tall and that it lights up! Questions: What are other popular places that tourist visit? What is the French school system like? There are HUNDREDS of places that tourists can visit in Paris. Some of my favorite that I’ve seen so far are the Musée D’Orsay, the Notre Dame Cathedral, the Sacre-Cœur Basilica, the Jardin de Luxembourg and of course, the Champ de Mars: the big park where the Eiffel Tower is! It reminds me a lot of being the National Mall and seeing the Washington Monument. Here comes the biggest difference. In the last year of high school, everyone takes a GIANT test called the Baccalauréat, or the Bac. It’s WAY harder than SOLs or even the SAT. There are 3 kinds of Bac exams: one that prepares you to go to college (Baccalauréat générale), one that prepares you to go to a technical school (Baccalauréat technologique) and one that prepares you to go out into the workforce (Baccalauréat professionelle). Once you receive your scores, you can choose what College you want to go to. If you get a super high score on the Bac générale plus study for two more years at a CPGE (classes préparatoires aux grandes écoles), you can apply to attend one of the “Grandes Ecoles” which are sort of like the equivalent to our Ivy League schools. Otherwise you can choose to go to a public university. Because most schools are publicly funded by the government, tuition to university is VERY low. Another big change from our system! Have a great end of the school year! À bientôt! We loved reading about the Eiffel Tower! Thanks for posting about such an interesting topic. We found the math problems interesting and challenging. In groups we were able to work together to conquer the questions! Thanks for getting our mind thinking about measurement in a fun way! We were wondering… are you visiting other places while you’re overseas, if so, where? Do you know how to speak French fluently? Thanks for reading and good job with the math problems! I don’t know how to speak French fluently. I’ve been taking French class since I was in the 7th grade, and now I’m so happy to be in France to finally practice with actual French people! I’m getting better every day and hopefully one day, if I keep practicing, I will become fluent! Are any of you bilingual? Previous PostOh, and in case you weren’t already jealous…this is the view from my bedroom.